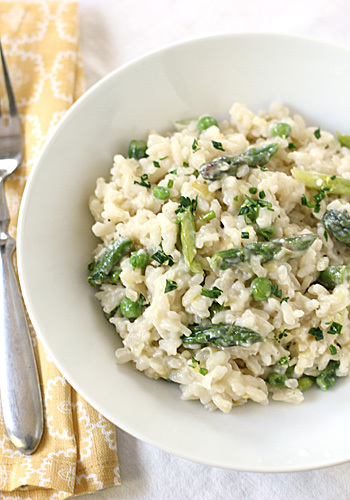 Here is a basic risotto recipe that relies on seasonal vegetables for flavor. It is hearty, comforting, and a perfect way to enjoy what's fresh at the market or what you may already have on hand in your refrigerator or freezer. Risotto may seem like a complicated and time consuming dish to prepare, but it is not as labor intensive as it has been made out to be. In fact, while the rice simmers (with an occasional stir of the spoon), you can prepare other components of the meal, like searing a chicken breast or fillet of salmon, tossing a salad, or warming up a loaf of crusty bread. You can also prepare risotto according to your own taste and texture preferences. I like to use a combination of leeks and shallots in this recipe, but you can easily substitute for both with two yellow onions. Asparagus and peas are the stars in the dish, but baby artichokes, mushrooms, or ramps would also be tasty. 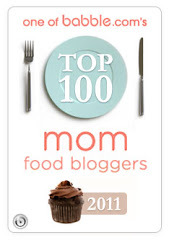 I use chicken broth to cook the rice, but to keep it vegetarian you can use vegetable broth instead. As far as texture goes, I like my risotto creamy, but not too loose. Having said that, you can add additional broth to reach the consistency of your liking. 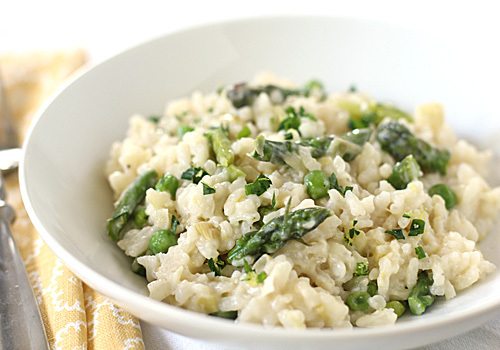 Serve the risotto as a side to a meal or make it the one dish wonder for the evening. Creamy, warm, and satisfying, this is a perfect dish for those chilly mid-Spring nights. In a small bowl, combine the parsley, chives, and lemon zest; set aside. In a large Dutch oven or saucepan, heat 1 tablespoon of the butter over medium heat. When foaming subsides, add asparagus and 1/4 cup water. Cook, stirring occasionally, until water has evaporated and asparagus is crisp-tender, about 4-6 minutes. Add the peas and continue to cook for 1 minute. Transfer vegetables to a plate and set aside. In the same Dutch oven or saucepan, heat 3 tablespoons of the butter over medium heat. When the foaming subsides, add the leeks, shallots, garlic, salt, and pepper. Cook, stirring occasionally, until leeks and shallots are softened, about 4-5 minutes. Add the rice and cook, stirring frequently, until grains are translucent around the edges, about 3 minutes. Add the wine and cook, stirring frequently until fully absorbed, about 2-3 minutes. When the wine is fully absorbed, add 3 cups of the hot broth. Simmer, stirring every 3-4 minutes, until the liquid is absorbed and the bottom of the pan is almost dry, about 12 minutes. Stir in 1/2 cup of the hot broth and cook, stirring occasionally, until absorbed, about 3 minutes; repeat with additional broth 3 or 4 times until rice is al dente. Off heat, stir in remaining tablespoon of butter, Parmesan, and lemon juice; gently fold in asparagus and peas. If desired, add up to 1/4 cup hot broth to loosen texture of risotto. Serve immediately, sprinkling each serving with the herb garnish and passing additional Parmesan separately. Enjoy! Risotto is my absolute favorite and this one looks delicious! I love a good risotto, just that stirring immediately calms me and there's the delicious result of course! Your version looks perfect for this season, love the addition of a little lemon too. I made this last night - very tasty! I used ramps instead of leeks for mine.